ScratchJr is a free programming language for children ages 5-7. ScratchJr utilizes block programming to allow children to create their own imaginative stories and games. The ScratchJr programming app was created as a collaboration among the DevTech Research Group at Tufts University, MIT’s Lifelong Kindergarten Group, and the Playful Invention Company through generous funding from the National Science Foundation (DRL-1118664 Award) and the Scratch Foundation. In the summer of 2014, ScratchJr was released as a free iPad app. Today the app has over 9.5 million iOS downloads and is available on iPads, Android tablets, Amazon tablets, and Chromebooks. Furthermore, volunteers from around the world have helped translate ScratchJr into 12 languages! To learn more about our research using ScratchJr, please take a look at our publications. Since January 2016, the team has used Google Analytics to collect ScratchJr user data. Google Analytics is a free tool that allows access to user activity as it happens in real-time on the app, as well as audience location, acquisition, and behavior. However, given ScratchJr’s young demographics, privacy was a top concern for the team. Only non-identifying information is collected and researchers do not have access to the pictures or sounds that children can import or any of their specific projects. Results from Google Analytics show that there is a spike in usage each year in December, which corresponds to Computer Science Education Week. Furthermore, ScratchJr is used most often during school hours. As of February 2018 over 20 million ScratchJr projects have been created, and over 26 million projects have been edited and revised. Furthermore, over 600,000 projects have been shared with others via email or Apple AirDrop. The map below shows the top 10 countries using ScratchJr are: United States (33%), United Kingdom (14%), Australia (8%), Canada (6%), Sweden (4%), France (3%), Spain (3%), China (3%), South Korea (2%), and Japan (2%). To learn more about current research involving ScratchJr, visit The Coding Brain and Family Coding Days project pages. 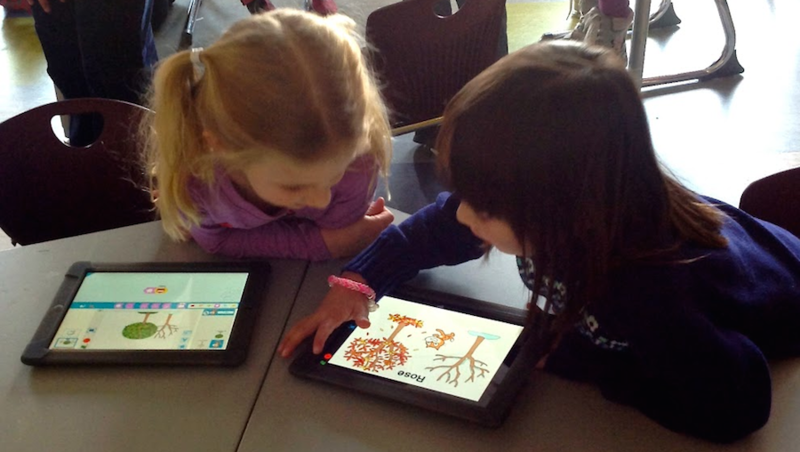 Collaborative ScratchJr Project Guide – When starting out, children often use one tablet to play with ScratchJr. With more complex programs and more iPads, ScratchJr can be used to make a multi-tablet collaborative project, an interactive game, or both! With a multi-tablet collaborative project, the images and movements can span across multiple screens to make their story even more dynamic. The characters on each tablet can be programmed to play at the same time or even staggered to make them appear to move between tablets. ScratchJr can also be used to create a game where multiple tablets have characters that interact with the other iPads and with the players. Collaborative ScratchJr projects can have an overall theme, storyline, or learning goal and allow children to interact with the app and with each other in new, creative ways! ScratchJr Scavenger Hunt Guide – The ScratchJr Scavenger Hunt is an activity that encourages children to include off-screen elements in the games they program. It’s just like a regular scavenger hunt, but it is designed in a way that includes the ScratchJr app. To play, each participating child programs a game or challenge to be completed. When the challenge on an iPad is solved a clue is given that brings the players closer to the treasure. This activity can be done with two or more people, and either one or many iPads. Students interact with other students, their physical environment and the ScratchJr app in an engaging and challenging way! Transitioning from ScratchJr to Scratch – This guide is for educators whose students have mastered ScratchJr, or are feeling restricted by it, and wish to move on to learning Scratch. While there is always more room for creativity in ScratchJr, there is also a potential for expanding both the creativity and the computational thinking learning in Scratch. There are a wide range of resources available for learning ScratchJr and Scratch, but this guide hopes to offer resources for the transition between the two platforms. The curriculum focuses on building on students’ knowledge of ScratchJr in order to ease their transition into learning Scratch. ScratchJr. Art Curriculum – This three lesson curriculum allows students to explore self-expression and creativity through self-portraits. Two lessons involve creating offscreen art projects that incorporate student’s work in ScratchJr. This is a beginner to intermediate ScratchJr activity – students should know how to add a character and change the background. The lessons will culminate in students creating frames from recycled materials that will frame their tablets to show off their self-portraits. Find other curriculum resources for ScratchJr on the ScratchJr website. To participate in research involving ScratchJr visit our Get Involved page.